The output memory of the CMD prompt can easily be extended for longer text outputs! The screen buffer size that you set with this option is temporary and only used when the command prompt is open. You can also set the option as the default value. Especially if you want to list longer file list, it can be quite helpful. 1.) ... Standard, or only temporarily extend the memory size! 2.) ... Changing the screen buffer size of the command prompt! 3.) ... What to consider when extend the output memory?! 1.) Standard, or only temporarily extend the memory size! Here you decide whether the memory should be permanently, or only temporarily increased! Temporary means here for the current Windows session, when restarting standard values ​​are used again. By default, the values ​​for the currently logged in user are permanently changed as long as no further or new changes are made. (Image-1) output memory of the CMD! 2.) 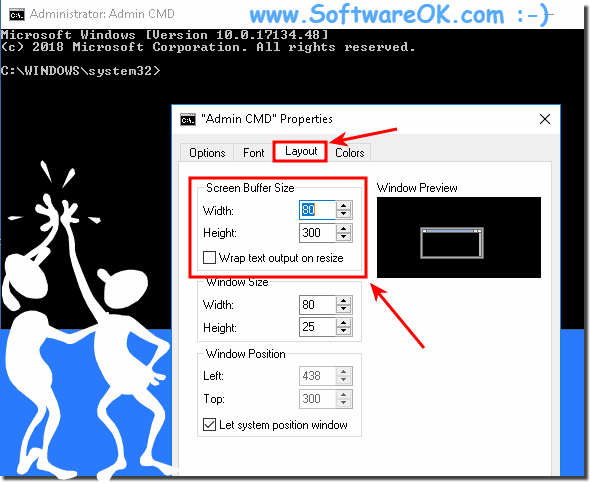 Changing the screen buffer size of the command prompt! Simply select the required size for the equalization memory. (Image-2) Extend the output memory command prompt! 3.) What to consider when extend the output memory? Actually, you have to be clear whether you need the change temporarily or permanently (default), if the changes are made, they will be valid until the next command. In this example, you not only learned how to increase the screen buffer size, but also what these prompt values ​​are at all. You can change it for your account under: Windows 10 Pro, Enterprise, Home, Windows 8.1, Windows 8, Windows Server 2016, 2012, 2008, Windows 7 Basic, Professional, Starter, Ultimate. Because it is one of the oldest windows programs. See also: How to scans all protected system files (command-line)? How to customize Command Prompt Memory? How to extend Command Prompt Memory Size on Windows? Can I expand Command Prompt Memory on Windows? It is possible to enlarge ram memory of Command Prompt Memory on Windows?